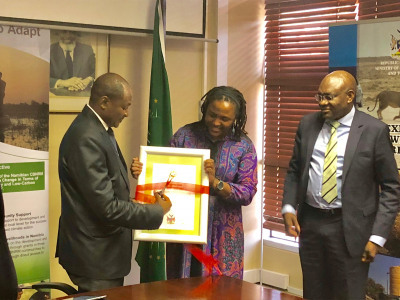 30 July 2018, Windhoek, Namibia: The Minister of Environment and Tourism, Pohamba Shifeta officially launched the Call for Proposals on Climate change Grants in support of the Empower to Adapt: Creating Climate Change Resilient Livelihoods through Community-based Natural Resource Management (CBNRM) in Namibia project, at a press conference event in the capital Windhoek, on 30 July. The five-year project, financed by the Green Climate Fund to the tune of US$ 10 million was launched in 2017 and is expected to build the resilience of more than 76,000 people living in CBNRM areas and improve management of 7,200,000 hectares of communal areas in Namibia. The project specifically looks at increasing climate resilience in productive landscapes and socio-economic systems in CBNRM communities, by working directly with local stakeholders and anticipated beneficiaries. The project further aims to promote the development of community-level strategies and implement technologies that will reduce climate change threats to the local livelihoods. Through the grant facility, created under the project, the EIF intends to invest up to US$ 8 million (an estimated N$100 million) into envisaged 33 grants to successful grantees across three investment windows - Climate Resilient Agriculture, Climate-proof Infrastructure and Ecosystem Based Adaptation. Individual Grant sizes are estimated to range between US$ 50,000 and US$ 400,000 (N$ 1.2 million and N$ 5.3 million) and the project duration is expected to be between 1 – 3 years. Speaking at the launch, Hon. Pohamba Shifeta outlined the role of the Enhanced Direct Access (EDA) modality in climate financing and its importance in allowing for the delivery of funding from the GCF directly to community-level entities. “This mode of funding devolves decision-making to nationally accredited entities, such as the Environmental Investment Fund, as opposed to channeling funding through bilateral and multilateral agencies, as many donors would traditionally do. This funding mode also ensures strong country ownership and multi-stakeholder engagement (including civil society) and under the strict auspices of the Ministry of Environment and Tourism. This is exactly what we are seeking to do in this case”, he stated. He also called on the leadership of Namibia’s more than 80 conservancies and community forests to use the training and capacity building under the first component of the project and take meaningful advantage of this funding opportunity by developing climate resilience projects that will improve their livelihoods. Eligible entities for these grants are all duly registered and gazetted Communal Conservancies and Community Forests. The call for proposals starts on 3 August 2018 and closes on 3 November 2018. Details on specific focus areas for this call and other application requirements are listed in the Grant Application Guidelines, available at the CBNRM EDA Project Management Unit at the Environmental Investment Fund Head Office. Applicants must submit a project proposal in the format prescribed by the Environmental Investment Fund, which should reach the Fund no later than 3 November 2018, 17:00.